Wie es eben immer so ist, brauchen neue Erkenntnisse immer etwas Zeit um sich durchzusetzen. 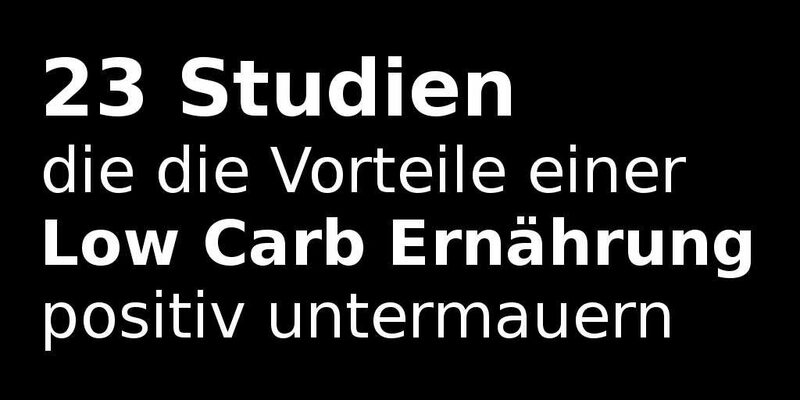 Auch wenn die Vorteile einer Low Carb Ernährung auf der Hand liegen, logisch sind und es sich tatsächlich gar nicht um neue Erkenntnisse handelt sondern um das Realisieren/Wiederentdecken unserer ursprünglichen Ernährungsweise wie sie war als wir noch steinzeitliche Jäger und Sammler auf der Suche nach Nahrung umher zogen. Dort dominierte fettes Fleisch als wichtigste Nahrungsquelle, siehe beispielsweise die Bush Tucker Diät der Aboriginies, wie man das auch heute noch bei Völkern sehen kann die noch in diesem ursprünglichsten aller Modi leben, von denen es leider immer weniger gibt. Sicher gab es damals auch schon Mangelerscheinungen. Allerdings waren diese bedingt durch akute Nahrungsknappheit, im Gegensatz zu unserer westlichen Gesellschaft, die im Absoluten Nahrungsüberfluss lebt und sich den Luxus erlaubt unterm Strich wahrscheinlich mindestens 50% aller produzierten Lebensmittel weg zu werfen, sei es, dass das Haltbarkeitsdatum abgelaufen ist, der Teller nicht leer gegessen wurde oder die Lebensmittel vergammelt sind bevor sie konsumiert werden konnten. Und dennoch wird unsere Gesellschaft immer fetter und, auf den zweiten Blick, ungesünder, weil sie sich mangelhaft ernährt. Samaha FF, et al. A low-carbohydrate as compared with a low-fat diet in severe obesity. New England Journal of Medicine, 2003. Sondike SB, et al. Effects of a low-carbohydrate diet on weight loss and cardiovascular risk factor in overweight adolescents. The Journal of Pediatrics, 2003. Aude YW, et al. The national cholesterol education program diet vs a diet lower in carbohydrates and higher in protein and monounsaturated fat. Archives of Internal Medicine, 2004. Yancy WS Jr, et al. A low-carbohydrate, ketogenic diet versus a low-fat diet to treat obesity and hyperlipidemia. Annals of Internal Medicine, 2004. JS Volek, et al. Comparison of energy-restricted very low-carbohydrate and low-fat diets on weight loss and body composition in overweight men and women. Nutrition & Metabolism (London), 2004. Daly ME, et al. Short-term effects of severe dietary carbohydrate-restriction advice in Type 2 diabetes. Diabetic Medicine, 2006. McClernon FJ, et al. The effects of a low-carbohydrate ketogenic diet and a low-fat diet on mood, hunger, and other self-reported symptoms. Obesity (Silver Spring), 2007. Gardner CD, et al. Comparison of the Atkins, Zone, Ornish, and LEARN diets for change in weight and related risk factors among overweight premenopausal women: the A TO Z Weight Loss Study. The Journal of The American Medical Association, 2007. Halyburton AK, et al. Low- and high-carbohydrate weight-loss diets have similar effects on mood but not cognitive performance. American Journal of Clinical Nutrition, 2007. Dyson PA, et al. A low-carbohydrate diet is more effective in reducing body weight than healthy eating in both diabetic and non-diabetic subjects. Diabetic Medicine, 2007. Shai I, et al. Weight loss with a low-carbohydrate, Mediterranean, or low-fat diet. New England Journal of Medicine, 2008. Tay J, et al. Metabolic effects of weight loss on a very-low-carbohydrate diet compared with an isocaloric high-carbohydrate diet in abdominally obese subjects. Journal of The American College of Cardiology, 2008. Volek JS, et al. Carbohydrate restriction has a more favorable impact on the metabolic syndrome than a low fat diet. Lipids, 2009. Brinkworth GD, et al. Long-term effects of a very-low-carbohydrate weight loss diet compared with an isocaloric low-fat diet after 12 months. American Journal of Clinical Nutrition, 2009. Hernandez, et al. Lack of suppression of circulating free fatty acids and hypercholesterolemia during weight loss on a high-fat, low-carbohydrate diet. American Journal of Clinical Nutrition, 2010. Krebs NF, et al. Efficacy and safety of a high protein, low carbohydrate diet for weight loss in severely obese adolescents. Journal of Pediatrics, 2010. Guldbrand, et al. In type 2 diabetes, randomization to advice to follow a low-carbohydrate diet transiently improves glycaemic control compared with advice to follow a low-fat diet producing a similar weight loss. Diabetologia, 2012. Ganze Webseiten-Inhalte übersetzen kann man hier. Originalartikel mit etwas mehr Details zu den jeweiligen Studien, inklusive Infografiken: hier.